This is the time of the year that the lesson of perseverance really comes into play. Not only are everyone’s (my) allergies wreaking havoc on our bodies, but STAAR tests are happening, school events are ramping up, and everyone starts to get the end-of-year wiggles. I have blogged here about perseverance multiple times, and good examples of how it is taught in the dance world, but I am inspired to touch on the subject yet again as we soldier on into our last competition for EDC, plan for summer, gather information and materials for our spring recital, etc. When we discuss perseverance at the studio we say, “Keep going, no matter what.” If you fall down? Get up and keep going. If you are frustrated with a new step or a piece of choreography? Keep going. If you are tired? Keep going. The only way to get there is to go. The journey may not be as picturesque as you had hoped, but when you accomplish your goals you can look back and appreciate all the times you got back up. We have a lot of discussions on this blog about how dance teaches life-long lessons and starts a journey to confidence and self esteem. It’s one thing in the classroom to accomplish a technical skill or to push yourself to pick up choreography faster and more cleanly. It’s a whole different conversation when we approach the idea of pushing past the technical skills and into the artistry of dance. What makes a dancer a performing artist? It isn’t perfect technique, yet the technique becomes the toolbox for a dancer to pull from as they start to tell stories with their bodies and emotions. 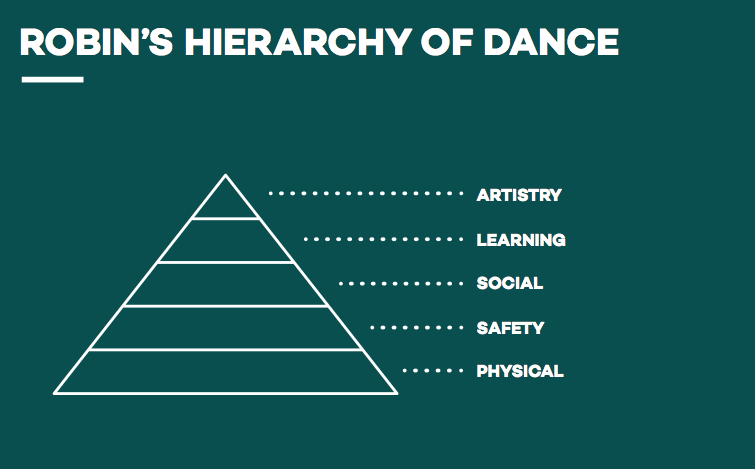 After an interesting conversation with my mom, who is a music teacher, about this topic she suggested I do some research into how learning in the dance studio can relate to a hierarchy of needs. I did a search, and I pulled up this article about reframing the classroom to Maslow’s Hierarchy of Needs, which I remember learning about in college. While the article is geared towards teachers and the goal of getting more people dancing, I did love this excerpt that is more applicable to everyone. “Maslow developed a hierarchy of needs to explain basic motivations behind human behavior. The idea is simple: You start at the bottom with the basic needs of food, water and air to survive. Once one level of needs is satisfied you become more concerned with the next, and you move up. So how does this help us understand how we learn to dance? Physical – Get people moving. It’s the golden rule of dance. People learn best through connecting with music and their bodies, not listening to your voice. Safety – assuming your physical safety is not at risk, this is about emotional safety. Judgement from yourself and others is the death of dance. Social – people want to interact and feel connected to each other and their teacher. The stronger these bonds, the more safe and supported people feel. Learning – consuming movement and information about dance to progress and master skills. At this point, what looks good to others and feels good to you are usually quite far off. Interested in joining us? Our Summer Camp and Class schedules are up online.